It's random Friday. I've got 5 things to say. 2. Recently Paul let it slip (not sure how we got on the topic) that I drank one Diet Pepsi everyday when I was pregnant with Pierce. Pierce got so mad at me! He was all, "BUT I DON'T LIKE SODA!" When Paul asked him if he could remember when I drank soda when I was pregnant with him, he swore that he did in fact remember, and that he hated it. 3. I bought a pair of skinny style 80s jeans on Kohl's clearance for $5. They are incredibly wild (for me) with black flowers over gray denim. I totally would've rocked them in high school, but I wasn't sure I could pull them off now. I got brave enough to wear them out recently, and I got so many compliments that now they rank up there as one of my favorite clothing pieces. 4. I saw a red breasted robin last week. Immediately my winter mood lifted. Now I know that spring is coming. 5. Since spring is coming, I planted carrots, lettuce, and pea seeds in the garden. Looking forward to my own fresh veggies, if all goes well. P.S. 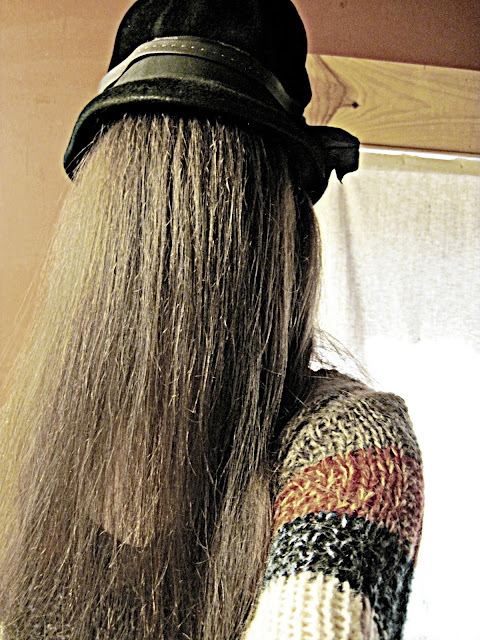 - If you like the Cousin It hat, it's available for purchase in my Etsy store. Then you can get your own Cousin It on. My hubs would kill me (okay, that's an exaggeration,) if I cut my hair. I can't wait to see your new do. Oh Lisa love your hair and your big heart. I bet you still rock those jeans. You just crack me up! Can't wait to see your new do! If I had glorious hair I would wear it long... unfortunately my hair is better kept above the shoulders so that I don't truly look like IT! Love the hat and I bet you do rock those jeans~! 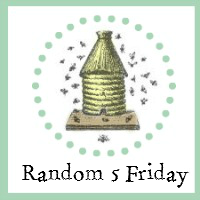 I love all your random thoughts! We have robins here too. LOL... LISA!! That is so funny. Can't wait to see your new doo. Great deal on the jeans! HOLY COW! It's so long. :> I'm sure it looks great. And I think the jeans must be excellent and so cute on you. Too hilarious about P and the soda. Cracks me up what kids associate and say. I love your long hair. I wish I could pull it off. But it goes all flat on me on top. I look like a haggard Cousin It. Nice to have those veggies in already,it is still frozen here. Love your long locks and wish I could get away with wearing my hair long. I know Double D would love it. Your boys crack me up. I like my hair cut short, but my husband hates it. Hummm...but I hate his beard. He still has that. Thanks for stopping and the B/D wish. I love your lifestyle and where you live. You have a beautiful family and lots of young energy around your house. You have lots of strong, healthy hair and that means lots of Jing in Chinese health. I seen a butterfly last weekend at our house! I can't wait for Spring! Yep! You do look like cousin it! lol I really need to get my hair cut too. If the wind blows just right and I don't have it up then it gets caught in the truck door when I'm out! lol Maybe Pierce likes the real stuff instead of the diet kind??? I can't drink diet drinks at all. Makes me sick and I mean SICK! I'm looking forward to pictures of the new do. The jeans were a great find - still rocking the fashion! 20 year reunion, how exciting. Mine is in 2 years... I seriously cannot believe it has been that long! You are ridiculous!!! But I love it! I'm glad you got your skinnies and it worked out so well! You have so much to do- and lots of hair that needs taking care of. Cousin IT for sure!!! And maybe a little bit of ZZ Top thrown in as well. The Pepsi story is an absolute scream, it is one you definitely need to write down. I love the hat! I just went shorter last week and I love it! I've been threatening for two years...but finally did it. Love Kohl's too, just never do get there on a good sale day. Sigh! I saw a robin too...but he was shivering! Hahahaha... everytime I see that picture, I have to laugh. We have been seeing robins but the poor things are probably freezing... Really cold here. Your hair looks superb!! And I would love to eat the fresh veggies and fruits planted in a garden! For me, the true sign of Spring is when the red-wing blackbirds start to sing...and they are singing this week!! Hooray! Kudos for you for getting seeds planted already. My garden is way to muddy right now. Can't wait to see the haircut. I wish I had a garden to plant the seeds in. Used to have. Now can't get out much. Dragging oxygen with me every where I go. But good luck on your future harvests. I would love to plant a vegetable garden!